Although he had a number of successes to his name (including an Academy Award for Rango), Verbinski doesn’t ever seem to have been marked for success the way Cimino was. Many people – frustrated, perhaps, and not entirely unjustly, by the bloated mess of the Pirates of the Caribbean sequels – seem to view him as just another cog in the Hollywood studio system, not unlike another Michael Bay, with a penchant for indulging in the kind of convoluted, overwrought, soulless storytelling that characterizes the very worst of modern blockbusters. In contrast, I maintain that he is one of the few directors working in blockbuster filmmaking today who consistently displays a personal vision and could be considered an auteur. In the decade between Curse of the Black Pearl and The Lone Ranger, Verbinski amassed a body of work (the three Pirates films and the animated Rango) that demonstrated a painterly eye for lavish visuals with hints of surrealism, a penchant for well-staged and inventive action, a love of cinematic tradition and understanding of genre, and a melancholy sense of nostalgia, a fascination with the ends of eras brought about by the forces of progress. I maintain that all of these ambitions come together in a movie that is not stupid at all, even if it does, at times, pretend to be stupid: Gore Verbinski’s colossal, epic, angry, mournful, summative magnum opus, The Lone Ranger. This is a film that aspires to so much more – and is more lovingly crafted – than the average blockbuster. 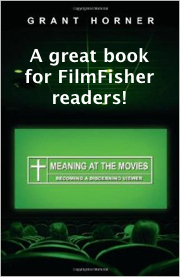 A film that is much more profound than just about anyone has given it credit for. A film that, in the words of one of its few defenders, Matt Zoller Seitz, deserves to be reevaluated twenty years from now and described as misunderstood. This didn’t all dawn on me at once. When I first saw The Lone Ranger, it was through deeply skeptical eyes. I, too, had bought into the perception of Verbinski as another journeyman – having turned my back on the Pirates films in one of youthful folly’s capricious attempts to be more grown-up – and was turned off by the scathing reviews and unappealing trailers. I came away having enjoyed myself and simply thinking, “Huh. That wasn’t half bad.” For years, I considered The Lone Ranger to be an underrated but flawed blockbuster, one that was kind of dumb, admittedly fraught with narrative problems, yet also made with a real sense of craftsmanship and boasting what was surely the greatest action set piece of its year. Because, really; look at that train sequence! The comparisons to Heaven’s Gate begin with the extravagant cost of their notoriously troubled productions. Both films went wildly over their proposed budgets: Cimino famously built an entire street and then had it torn down and reassembled, while for The Lone Ranger, two fully functioning locomotives were built from scratch. Both films have also been criticized for their length; Heaven’s Gate is nearly four hours long, while The Lone Ranger hits a solid two and a half (though this still does not quite reach the length of Peter Jackson’s loathsomely bloated Hobbit sequels). However, just as the sheer artistry on display in Heaven’s Gate has gone some way towards earning it some critical reevaluation, it is my strong feeling that the aesthetic accomplishments of The Lone Ranger have never received the attention they deserve. The most prominent example is the oft-cited (by me, at least) climactic train sequence, surely one of the highlights of modern blockbuster cinema. Verbinski brought a sense of fun and heart to the Pirates of the Caribbean films that separated their set pieces from those so abundant in blockbusters. He did so by grounding his films in practical effects and cinematic history, with an eye for physical comedy and the energy of silent cinema. Think, for example, of the duel in the spinning wheel from Dead Man’s Chest. It’s absurd, of course, but also grounded in a way that more “realistic” action sequences never are. Credit for making something like this work is due largely to Verbinski’s direction. He has an excellent sense of visual storytelling, bringing an old-fashioned sense of clarity to even the most overwrought proceedings. His best sequences are grounded in characters with clear motivations, with a sense of rhythm that carries the audience through a series of reversals of fortune not unlike those of a classic Roadrunner cartoon. Verbinski’s directorial prowess is not relegated solely to his handling of set pieces, though that alone should place him in the upper echelons of today’s blockbuster filmmakers. The Lone Ranger is a gorgeously well-crafted film all around, with painterly vistas that alternately pay homage to John Ford and Sergio Leone. The film is so visually striking that it works without sound; I suspect that a repeat of Steven Soderbergh’s Raiders of the Lost Ark experiment would be similarly rewarding here. Yet if we were to lose the sound, we’d lose Hans Zimmer’s wonderful score, some of his finest work: a blend of Morricone and Steiner, alternately rousing and mournful, culminating in a glorious reinterpretation of the William Tell Overture so indelibly associated with the Lone Ranger. There are countless references to the classic westerns to which Verbinski’s film is indebted. Themes, plot elements, and shot compositions are lifted liberally from Once Upon A Time In The West – which was, incidentally, my favorite western for quite some time. There’s the mourning of a mythic world lost to the march of progress, symbolized by a railroad tycoon in cahoots with outlaws. The totem (there a harmonica, here a pocketwatch) symbolizing past wrongs, a physical manifestation of our hero’s tortured past and longing for vengeance. In The Lone Ranger, the masterfully tense buildup to an attack on Rebecca’s (Ruth Wilson) farmstead, in which the villains’ presence is announced by the hush of insects and a flock of birds, is a direct homage to Henry Fonda’s introduction in Leone’s masterpiece. A parasol carried on horseback is not just another Verbinski idiosyncracy, but a reference to The Good, the Bad, and the Ugly. The romantic tension between the Lone Ranger (Armie Hammer) and his brother’s wife recalls critical interpretations of John Wayne’s motivations in The Searchers, and John Ford’s favorite hymn, “Shall We Gather at the River,” puts in an appearance. The homages reach further back still, to Buster Keaton’s classic The General, the manic stunts of which revolved primarily around trains. Critics tired of Depp’s recent slew of makeup-wearing weirdos heaped derision on his performance as Tonto, but I, for one, find the man’s antics to be relatively restrained in the role, shaping a character who takes on a persuasively melancholy inner life of his own beneath the collection of deadpan tics. The Lone Ranger himself is a bit more inconsistently characterized (for reasons that will be defended later), but Hammer commits to the earnestness that always underlies his buffoonery. As the Ranger’s older brother, Dan – a symbol of classic cowboy masculinity – James Badge Dale, a consistently underrated performer, invests his character with a weary gravitas. (Earlier in the summer of 2013, Dale stole every scene he had in Iron Man 3.) The cast is full of actors who embody their parts perfectly; William Fichtner bringing an air of brutal menace to outlaw Butch Cavendish, Tom Wilkinson imbuing railroad tycoon Latham Cole’s paternal stylings with a sinister edge, Barry Pepper investing just the right amount of exaggerated bluster into his buffoonish Cavalry officer. And while even the film’s defenders have conceded that it’s overlong, I believe that many blockbusters could benefit from the extra half-hour given to this one: where 2013’s Iron Man 3 and Star Trek Into Darkness were breathless sprints that struggled to squeeze humanity in between their moving parts, The Lone Ranger gave its characters and audience room to breathe. The first forty-five minutes are just about perfectly paced, calmly setting up the players while also taking time to establish atmosphere and mood. A couple years later, I returned to the film after having seen and eagerly dissected Matthew Vaughn’s Kingsman: The Secret Service, with which The Lone Ranger shares more than a few semiotic similarities. I still had the words of Scout Tafoya’s “The Unloved” video essay lingering in my ears. And over several months, the full extent of Verbinski’s achievement here dawned on me, and I became convinced that The Lone Ranger is a cinematic masterpiece. No one wants to hear what this film has to say – and moreover, no one wants to hear it from this film. No one wanted or was prepared to see a rollicking Disney adventure movie that was secretly about genocide. No one was prepared for a film bankrolled by one of the largest corporations in the world to be a scathing screed against the dark side of capitalism. No one expected a film released on the Fourth of July to be so furious about the ugliness of America’s history. Like Kingsman, it’s a film built on fascinating contradictions. And I humbly submit that there’s nothing quite like it in cinematic history. One of the criticisms most frequently directed at The Lone Ranger is that its frequent tonal shifts, from childlike glee to horror to melancholy to absurdist comedy and back again, are jarring and unwieldy – that the end result feels schizophrenic, like wildly disparate visions being crammed clumsily into one, almost as if multiple storytellers are jostling for control of the story. As it turns out, this is entirely by design. There are – to be a bit reductive for a moment – two ideas of the western in cinematic history. The first is the wide-eyed, optimistic version of John Ford and the Hays Production Code, perhaps best embodied by the Lone Ranger himself – a sweetly naïve, often simple vision of the American frontier as a backdrop for rip-roaring adventures and morally inflected fables. The second is the cynical, world-weary version of Sam Peckinpah and Sergio Leone – grimier, dirtier, more violent, more seedy and pessimistic. Many viewers and critics, myself included, were not terribly fond of the framing device that opens and closes The Lone Ranger (in addition to intruding upon and changing the course of the action throughout). Collider’s Matt Goldberg called it “pointless and irritating.” On the contrary, I maintain that it is essential to the film’s ambitions. By filtering his tale through the lens of an old, disillusioned Tonto and a young, naïve boy, Verbinski is giving us the means to interpret the film as what it is: a working out of two different attitudes towards the western genre. Tonto (and the film with him) responds by taking a different approach, although we’ll later learn that the farcical bank robbery scene has not been scrapped altogether but merely contextualized. Thus, the story proper does not begin until seven minutes into the film (a figure with which Blake Snyder of “Save the Cat” would undoubtedly take umbrage). It takes place in 1869, the year the Golden Spike heralded the completion of the First Transcontinental Railroad and the year of Jesse James’ first confirmed robbery – an immediate juxtaposition of progress and western myth. After all, what figure is more a mythic symbol of the Old West than Jesse James? The next forty minutes or so are played largely straight. There are flashes of humor, but they scarcely undercut the human drama or epic scale. The relationships on display are slowly falling apart, tinged with quiet sadness – within the love triangle that seems poised to dominate the film’s storyline, unspoken resentments simmer alongside wordless mourning for lost loves, communicated largely by terse insinuations and significant glances. The first act’s big set piece is fun, yes, but also comparatively brutal and mean-spirited, featuring innocent casualties and a Lone Ranger/Tonto partnership characterized largely by strife. This section concludes in what would be the darkest sequence in a film that didn’t also feature genocide: the ambush and massacre of the Texas Rangers by an outlaw gang, culminating in an act of cannibalism. (Yes, really.) Here we have Tonto presenting a parable of good but ineffectual men laid waste by greed, a picture of the Old West as a lawless and harsh land where sadness and injustice reign – the point driven home by a somber montage of the dead Rangers lying ignominiously in the dust. “Very dead,” Tonto affirms, but the tone takes a sharp turn into an extended, darkly comedic sequence in which Tonto quite literally scavenges the corpses for paraphernalia, just as Verbinski has constructed his film out of borrowed bits of cinematic history. It’s worth noting that, at this point, objects from the ostensible future – the empty popcorn bag presented to Narrator Tonto, for instance – work their way into the story, blurring the line between timelines. It’s at this point that Tonto seems poised to take center stage, but the Lone Ranger will not die. It’s as if the boy’s influence is incessantly nudging the story towards the more conventional narrative, in the form of the horse placing the white cowboy hat – the universal signifier of Good Guy in westerns – at the foot of the undead icon’s shallow grave. As the two forces jostle for control, the Lone Ranger in the story begins to develop not along the lines of conventional character development but as a symbol of the narrators’ shared outlook. Mere minutes after declaring (before the tonal break) that he doesn’t believe in firearms, he draws one (after the tonal break) on an unarmed Tonto. In between these events, he’s quite literally dragged through excrement, which is… well, apt. 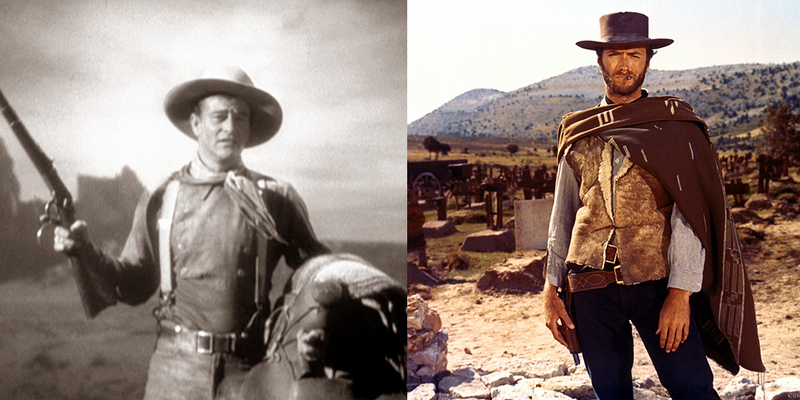 In the film’s first section, the Ranger is an ill-fitting outlier, a Jimmy Stewart character who’s wandered onto the set of a Sergio Leone picture. He’s a buffoon, utterly unprepared to deal with the realities of the world he’s entered – when an inebriated Ranger hands him a pamphlet for a brothel, he innocently inquires, “What’s this, dancing?” After the tonal break, the world recenters around him, forming a maelstrom of darkly comic absurdity. This section of the film juxtaposes the solemnity of the first half – the plotline revolving around poor, victimized Rebecca and her young son, Danny, is dark even by this film’s standards – against a more “fun” tone that recalls the lighter passages of Verbinski’s Pirates of the Caribbean movies. The film’s middle section is when the battle between its two narrators becomes most clear, personified in the push and pull between their counterparts, Tonto and the Lone Ranger. Just as Narrator Tonto frames his polemic in the mythic Old West for the boy, Tonto casts his story in a mythic light for the Lone Ranger’s benefit. In the campfire discussion (a classic staple of the genre) that opens the second act, Tonto describes Butch Cavendish as a “wendigo” – an evil spirit, traditionally associated with cannibalism, but also more generalized forms of greed and excess. The tragic backstory is a staple of the spaghetti western, perhaps nowhere best utilized – or more pointedly referenced by The Lone Ranger – than Sergio Leone’s Once Upon A Time In The West, in which Charles Bronson carries around and occasionally mournfully plays a harmonica that symbolizes a specific past injustice. Halfway through The Lone Ranger – chiastic structure places a work’s thematic key at the center of its “ring composition,” and though I’m not ready to argue that this film follows such a structure, I do believe it places its thematic key at its center – the Lone Ranger learns the truth about Tonto’s backstory through the monologue transcribed above. This is the film’s thematic lynchpin, what causes Verbinski’s vision to click into place. It is a microcosm of the film: the story of an individual who, to deal with overwhelming guilt, constructs a mythological framework through which to view the past. This is what Verbinski suggests that the western is: the myth that America uses to work through its collective guilt and filter out or otherwise dress up the ugly, unsavory truths of its past. It is at this point, halfway through the film’s second act, that the tone begins to shift and the fantasy begins to give way to reality. Tonto and the Lone Ranger dissolve their partnership soon after, as both are disabused of their ideals. Reid throws the massacre of Tonto’s tribe in his face before taking Cavendish to Cole, by whom he is promptly betrayed (with the aid of the US Army). The shameful treatment of Native Americans is the real tragedy at the heart of The Lone Ranger. An early shot of train tracks blocked by a herd of buffalo foreshadows that the Indians will be a roadblock for the railroad to overcome. Notably, a plotline revolves around the white outlaws, at the orders of the forces of progress, demonizing the natives by dressing up as them – recalling the way many classic westerns cast white actors as their villainous Indians. “Injuns don’t take no prisoners,” one explains to the bewildered Lone Ranger. “Only scalps,” adds the other, helpfully. When the Ranger touches a piece of “cursed silver,” he sees a hallucinatory vision of the slaughter of Indians, concluding in a shot suggesting his own complicity in the genocide. 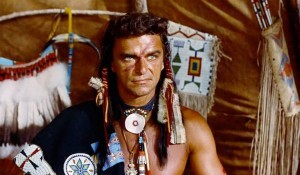 Tonto, the narrator, is first introduced by a plaque that labels him as the “Noble Savage,” yet the boy’s first reaction when he comes to life is, troublingly, to shoot him repeatedly with his toy gun – another foreshadowing of American unwillingness to face reality when it bursts through the artifice. Much has been made, understandably, of the scene in which a tribe is massacred at the hands of the U.S. Army. Many have expressed outrage that such a serious topic would be broached within a farcical adventure comedy, perhaps being better suited for a somber, Oscar-baiting “serious drama.” As I pondered this, it occurred to me that, if it was Verbinski’s intention to incite righteous outrage over genocide, he was largely successful. Perhaps juxtaposing such real tragedy and horror against the cartoonish antics of the Lone Ranger is a more effective way to convey their true gravity. 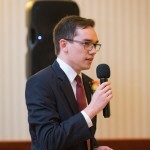 It’s the same principle at play in the climax of Kingsman, which revealed the problem of sexism in blockbusters by perpetuating it, cutting between the equally life-threatening dilemmas of its male protagonist and female sidekick in the same way Verbinski intercuts the massacre with Tonto and the Ranger’s hijinks. Like the boy, the American audience is distracted from the gravity of the natives’ real plight by their heroes’ imagined peril. (Hence, the moment with the horse noted above.) I suspect Verbinski chooses not to deal with the fallout from the massacre because the western genre never really has; in The Lone Ranger, the captain who gives the order to fire is, at the end, astonished to find blood on his hands. 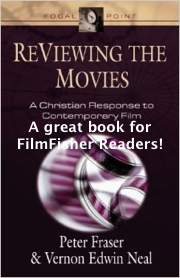 Christians and patriots will find the film unsettling when the villains repeatedly appeal to God and the greatness of the United States to justify their atrocities. Verbinski has always been a bit of an iconoclast, and his motives here may not be spotless; yet when viewed in light of the film’s larger critique, these touches strike me as well intentioned enough, desiring – justly – to provoke anger at the way the institutions and ideals of church and state are wrongly pressed into the service of evil rhetoric, rather than attacks on the institutions themselves. In many ways, the film really ends here, at the two-hour mark, with the idealistic fantasy of the western shattered as Tonto weeps over the death of his people and the boy is momentarily stunned, in disbelief that such a thing could happen “for silver.” Everything that follows is a happy but hollow epilogue, mandated by the expectations of the genre, offering a catharsis unable to offer any true solace after the horrors we’ve witnessed. The first shot of The Lone Ranger is of the Golden Gate Bridge under construction, as a title card informs us that it is the year 1933 – the same year the character of the Lone Ranger debuted on the radio. We are watching the construction of cultural icons, myths that will define a nation. The crier’s speech to the boy (transcribed above), an advertisement for the Wild West Show where old Tonto resides, is rife with contradictions, immediately establishing the wild west as a convergence of truth and falsehood: “as it really was,” “the greatest show on earth.” The myth of the Wild West promises authenticity and inauthenticity, fun and education. As Will peruses the various backdrops, Verbinski frames a model buffalo side by side with his flattened counterparts in the painted backdrop, an apparent juxtaposition of reality with artifice prompting us to consider – or question – the difference between the two. Matt Zoller Seitz, in a commentary on Tafoya’s “The Unloved” video essay, described The Lone Ranger as “a story about a story about a story, and ultimately a film about history as storytelling: the Grand Budapest Hotel of action westerns,” and the framing device certainly invites the comparison. Like Anderson’s film, The Lone Ranger filters its zany antics through a melancholy lens of wistful nostalgia. At the same time, it attempts to subvert the stories that have passed for history; Seitz views Tonto’s story as a “counter-myth,” aiming to “stop [the boy] from swallowing the official version of How The West Was Won.” Seitz’ point is a good one (as his often are): like the westerns it counters, Tonto’s story is not intended as a strict retelling of history, nor should it be taken as such. In the end, the film sadly suggests, repurposed stories may help to get at history’s ugly truths, but they cannot heal them. The farcical “damn bank robbery!” opening, earlier rejected by the boy, is ultimately accepted as part of a larger story. After the massacre of the Indians, the audience demands catharsis – that those who perpetrated the horrors will not “get away,” but will in fact be defeated by our heroes, perhaps with the unspoken promise that such evil will never happen again. The film’s climax is the boy finally taking over: the Lone Ranger, recently a buffoon, evolves with astonishing rapidity into the epic hero we all remember from the serials. But this is a comforting lie. The climax hinges on Reid telling himself such a lie, repeating Tonto’s long-ago-debunked myths to himself. “I’m a spirit walker,” he whispers, as the music swells triumphantly. “I can’t miss.” Within the framework of the story, he can’t; he shoots the gun out of the villain’s hand in a bit of pleasant, non-violent silliness, and the heroes’ hands are clean even as their foes are miraculously slated to oblivion as if by some benevolent omnipresent deity. Yet when one takes a step back, the truth is unmistakable: although this story has offered a pleasant resolution, history offers little such solace. In the big scheme of things, it makes little difference that a few imaginary bad guys went tumbling into the river, as satisfying as it may have been to watch it happen, set to the strains of the William Tell Overture. None of this makes a difference, really. It’s not history. It’s just a story we tell ourselves so we’ll feel better. And although Latham Cole’s watch goes drifting away down the river of time, Verbinski quickly returns us to a scene of the railroad band, battered but still going, playing “Stars and Stripes Forever.” One or two evil men may be gone, but the railroad – not evil, perhaps, in itself, but surely ominous and inscrutable in its monolithic inexorability – waits for no man. Throughout Verbinski’s five films of the past decade, there has been one overriding theme: that of mythic worlds of the past wiped out by the inexorable march of progress. Some take more optimistic approaches to the subject: the Pirates of the Caribbean trilogy ends with the forces of the East India Company routed by the pirates they sought to destroy. The Lone Ranger, however, even with its rousing climax, offers up more than a bit of resignation to go with it. Progress in The Lone Ranger is not an ideal to be worshipped, but a sad reality used as justification for heinous deeds, associated almost solely with greed. An otherwise superfluous sequence wherein our heroes pay visit to a brothel sees the establishment referred to as necessary for the railroad’s continued progress – “There ain’t no railroad without girls like mine doing the heavy lifting,” says the madam, Red (Helena Bonham Carter). A seeming throwaway detail in the same sequence implicates Cavendish, whose cannibalism is a metaphor for greed, in Red’s decision to become a brothel madam rather than a ballerina – a more innocent possibility now lost in the past, framed and looked upon with wistful longing. Greed also leads to an instance of callous violence against Chinese workers. The film essentially plays like a bitter anti-Capitalism crash course. In the second act, as they wander through the desert in search of the outlaws who have kidnapped Rebecca and Danny, Tonto and the Lone Ranger come across train tracks in the desert. This is a revelation, illuminating the villains’ motives and plans – namely, to progress through land already designated to the natives, starting a war with them in order to acquire it. In most blockbusters, the heroes would come across such information in time to thwart the evil plot, but not here; the tracks are already in place. There is no changing it. This revelation confuses even Narrator Tonto, shaking him out of his fantasy and back to reality. It is the first step in the deconstruction of the boy’s idealistic version of the Lone Ranger story. Soon after, the Lone Ranger meets Chief Big Bear, who explains that Tonto’s broken watch corresponds to his broken mind. He then proceeds to fix the watch – an action that coincides with reality beginning to catch up to the story. To the Ranger’s insistence that he can explain to the US Army, saving the Indians’ lives, the Chief replies with sad resignation: “It makes no difference. We are already ghosts.” In The Lone Ranger, to accept the passage of time is to accept that one is passing through it. Monument Valley lives up to its name in The Lone Ranger. (Although the film is ostensibly set in Colby, Texas, Verbinski draws attention to his use of the location in Utah.) It is a monument to a past that never existed, a visual link to the mythic Old West that acted as the backdrop to so many of John Ford’s works. 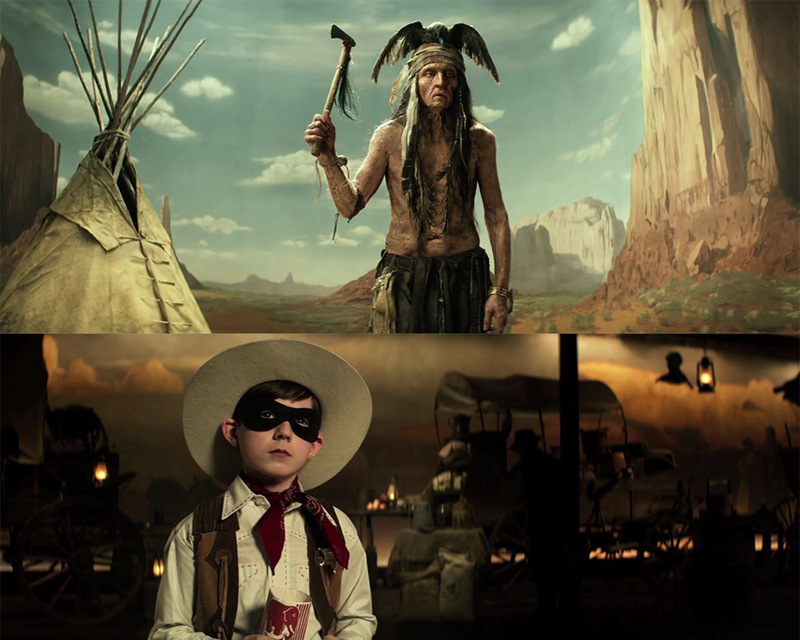 Verbinski frequently frames shots such that the railroads, the forces of progress, are traveling inexorably away from this past, the same past that forms the painted dioramic background of Tonto’s “Noble Savage” exhibit – and it is into this diorama that, in the film’s final shot, he disappears. Only in this mythic version of the past can he find solace. The film washes away the tragedy of genocide with a big train set piece, the equivalent of a child playing with his toys – all sociopolitical concerns washed away by pure, joyous entertainment. Yet in the end, both Tonto and the Lone Ranger are swept away by progress. Tonto, having discarded his silver pocket watch, gets a gold one from the railroaders. The Lone Ranger names his horse Silver, after the element that caused so much tragedy. Their victory, however fleetingly delightful it may be, is undercut at every turn. As the two ride off, Verbinski frames a rabbit in the foreground, eating a scorpion – a symbol, from earlier, of a natural order that is out of balance. All the Lone Ranger can do is walk away. There’s a moment I’ve mentioned before that perfectly encapsulates the allure of the western. It’s at the climax of the train scene: Tonto is held at gunpoint by Cole, who sneers, “Soon no one will ever know you people were here.” The Ranger aims his gun, with one silver bullet in the chamber, and whispers a comforting lie to himself: “I’m a spirit walker; I can’t miss.” With these words, history is undone and justice is served to the triumphant swelling of Zimmer’s score. Like the Lincoln Letter of Tarantino’s The Hateful Eight, it’s a lie so beautiful that the film itself aches, wishing it were true. But a comforting lie can only do so much. In his video essay, Scout Tafoya said, “There’s a melancholy that runs through even the most frenetic action sequence in The Lone Ranger. No matter how big a grin it puts on your face, it’s still about the death of thousands, not to mention our ideals, of the stain on our legacy as a united people.” He’s right. That melancholy extends to the film’s final image, of Tonto retreating into Monument Valley. The western may not be true, but it may be the only way to numb the pain of the past. And when you understand what this image means, here at the end of this crazy, angry roller coaster of a film, it makes you want to weep. Thanks Timothy. Really enjoyed this. This essay is just beautiful. It certainly brings a new light on how tragic the revelations this movie represents and especially that line about walking away from the unbalanced nature. This movie is definitely one misunderstood masterpiece and this essay just reinforced it’s place in my top favorite movies.